A bearded dragon will need space. The bare minimum size is 36″ x 12″ x 18″ for one lizard. Bigger is always better and much bigger is essential if you house more than one dragon in a cage. 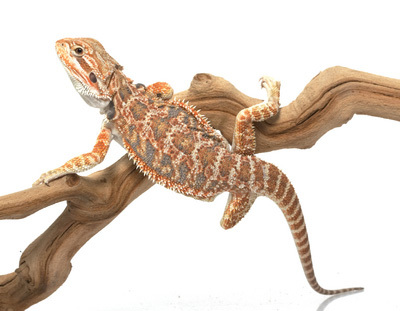 Height is also important because bearded dragons like to climb and sit on top of logs and branches. An aquarium or a terrarium fitted with a screened top can make a nice home for your pet. Your pet will require some special lighting. You will need to supply a UVB fluorescent bulb which is necessary for the metabolism of vitamin D3. The bearded dragon will also need a reptile daylight bulb or heat emitter. A combination light fixture that supports both fluorescent and incandescent light fixtures is required. Under-tank heating will come from a heat pad attached to the bottom of the tank. You should not use heat rocks because they can potentially form hot spots that could burn your reptile. If you see your dragon gaping (sitting with its mouth open) it is too hot. Turn off some of the lights, mist him with water, and if necessary remove him from the cage for a while. The substrate for the cage can be paper towels, newspaper, reptile carpet, or ceramic tile. Reptile sand and other loose substrates are not recommended due to the possibility of accidental ingestion. If your dragon likes to dig, a container with Eco Earth or a mixture of potting soil and play sand can be placed in part of the tank. Your lizard will also need a food bowl, smooth insect bowl (for mealworms, etc), and water dish. Dragons need a hide area like a cave or log. There are many natural-looking commercial shelters available. Sturdy branches, logs or rock formations are needed to keep your pet happy because bearded dragons like to climb and bask up high. You just have to make sure that the climbing areas are secure and won’t fall and hurt your dragon. You can add artificial plants and decorations to his home to create a more scenic habitat. Bearded dragons eat a lot and in return create a lot of waste. The lizard droppings and leftover vegetables must be cleaned daily. The water bowl, food bowl, and substrate must be checked for fouling and cleaned. The easiest way to clean the substrate is to use an aquarium fish net to scoop out the waste. The cage decorations, decor, and glass should also be cleaned periodically.